Las Vegas, formerly the seedy setting of Showgirls, has been heavily rebranding recently. Mainly by aligning itself with the great talents and tastemakers of our time: Drake, Cardi B, Lady Gaga. And Damien Hirst, one of the world's richest living artists. Last month, Palms Casino and Resort unveiled its Hirst-designed "Empathy Suite." The colorful penthouse room starts at $200,000 a month for a minimum two-night stay in a two-floor private mansion-museum with two master bedrooms, a home theatre, "sculptural jacuzzi" with a panoramic view of the Strip, gym, spa, and "salt relaxation room." You also get an AA pass to KAOS, the Palms nightclub where Cardi B will shortly begin her residency. Now Palms has announced yet more Hirst surprises. The resort has acquired the artist's 60-foot-tall 2014 sculpture Demon with Bowl, which now looms over the pool. (Oddly, as Artnews notes, due to the inconvenient size it has never actually been exhibited before — a resin copy was made for Hirst's Venice biennale show). 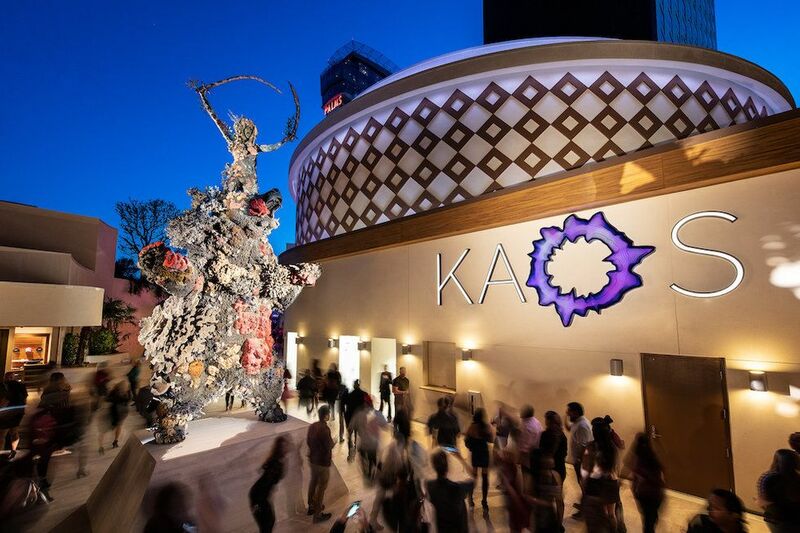 His 2015 sculpture Warrior and the Bear was also purchased by Palms, and now stands outside KAOS. Hirst fans who also happen to be billionaires — that Venn diagram is basically just a circle — will be pleased to know that Palms also now offers a luxury "Empathy Suite" package, called "KAOS THEORY." For $1 million, you may stay for three nights in Hirst's luxurious chamber, provided with an impossible amount of wine: 30 liters of Ace of Spades rosé, 30 liters of Ace of Spades brut, 100 bottles of Dom Pérignon Rose Luminous, 100 bottles of Dom Perignon Brut Luminous, and five bottles of Clase Azul Ultra Magnum. And you could see Cardi B. Book now!